HomeHeadphone ComparisonsSennheiser Momentum vs. KEF M500 | SIMILAR? Before we get into the Sennheiser Momentum vs. KEF M500 comparison, grab a snack, sit back and relax because.. Sensitivity: 103 dB. What is Sensitivity in Headphones? Cables Included: 2, one with iOS 3 button and mic, one standard with 1/4″ adapter. Cable Detachable: Yes. 2.5mm insert. The KEF M500 has a good bass response, and the overall sound of the cans comes across as balanced and detailed sonically speaking. Even from positive reviews, the feeling is that even the slightest movement will have them dislodged from your dome. So it becomes a bit of a chore to achieve proper fit, and the headphones themselves remain somewhat uncomfortable despite the fantastic build. Paired with an amp they really shine, but it’s not mandatory. Overall the M500 provides a neutral, balanced response with a touch of warmth and a slightly elevated bass. Warm overall character with a tight low end. Good natural clarity and detail. Balanced and natural. Instrument separation is good. Open and airy. While comfortable overall, it may be hard to get a good fit. Cracking and static/sound going in and out. Leather peeling after a year. Pairing these with an amp will tighten things up, but it’s not mandatory. How to choose a Headphone Amp! Ear-cups swivel 90 degrees, and the cups can fold flat. There’s a mid bass hump that may sound unnatural depending on who you ask. The headphones will reveal how good or bad your source files are. Adjusting the headband is a bit cumbersome. The cable without the mic may sound slightly better to your ears. The Smart Hinge allows them to easily conform to your head, but some say it may affect build quality down the road. The inline remote buttons are very small and may require your fingernail to operate adequately. The M500 values balance and neutrality above thump, but that doesn’t mean that these aren’t enjoyable. Solid build, and touch of bass and warmth while still retaining an impressive amount of detail and clarity. Comfort is a mixed bag (good for the most part), but you will likely have issues in getting a good fit. They tend to slide around on your noggin. Both take a dip around 300-400Hz, but the Momentum’s is a bit more gradual and doesn’t fall as far, while the M500’s takes a sharper dip. By and large, the mid-range on these two is very similar. Comfort. The KEF M500 is known for having issues staying on your head. The Momentum’s do not suffer from this problem. Presence. The M500’s lack some vocal clarity that the Momentum’s provide. Brightness. I would say the KEF M500 is a bit brighter, with more sparkle than the Momentum. There’s a peak at around 9k, and with the Momentum there’s another peak at 9k, but it’s much smaller by comparison. Many believe in the Sennheiser Veil, which basically just means that most Sennheiser offerings have a bit of a “darker” sound in the treble regions. Personally, I think it’s sort of a myth, though there is some truth to it. By and large I don’t notice it that much, but as far as these two babies are concerned, yes, the Momentum isn’t as bright as the M500. What is the Sennheiser Veil? Mid-bass. Both have a mid-bass hump, but the M500’s is more subtle and gradual, while the Momentum’s is very sharp and then fleeting. Both occur between 100-200Hz. The Momentum’s bump teeters on rendering some tracks bass a tad bloated, but thankfully they manage to get away with it. Overall, the bass is definitely more pronounced on the Momentum than it is on the M500. Materials. 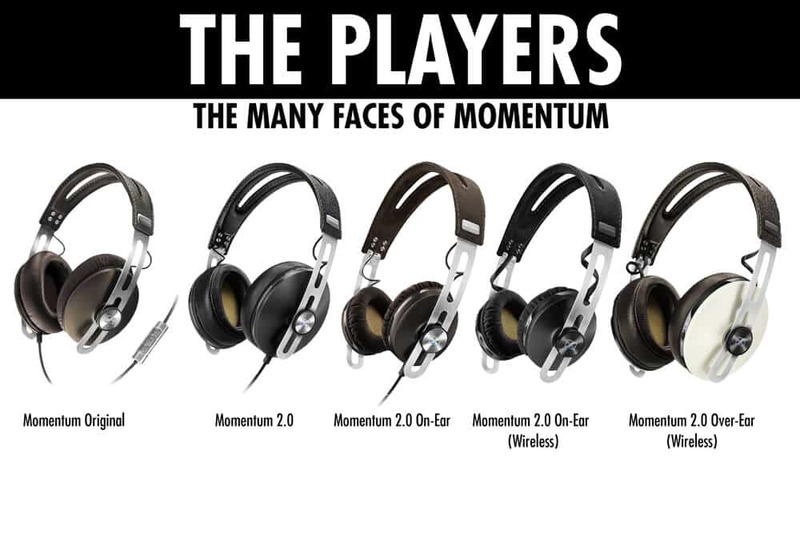 The Momentum’s have elements of stainless steel while the M500’s sport aluminum. Treble. Between 3-4k, the M500’s spike a little, giving instruments and vocals some added clarity. The Momentum’s by contrast take a dip and then keep going down resulting in a nose dive around 4-5k. Overall. The Momentum’s have a warmer signature with no harshness, but you may desire some more clarity at times. Personally, I love the non fatiguing, somewhat balanced sound, and have trouble with mid-range spikes from time to time. That said, the M500 has a greater sense of air about it, but both headphones have a pretty natural mid-range with all things considered. I like the fact that the bump between 3-4k for the M500 doesn’t feel artificial or forced. It gives the sound a subtle boost while also not treading into sibilant territory. What does Sibilant mean? Soundstage. The Momentum has a bit of a larger soundstage. What is Soundstage? Just for clarity’s sake, there are a bunch of different versions of the Momentum. I would bypass the original, as the 2.0 improved upon comfort, build, and to a degree sound (the mid-range in particular). Consensus wise, it’s a no contest. The 2.0 is a better headphone in all respects. Deciding between the two depends on the type of experience that you’re after. If you’re looking for more enjoyment, and a “fun” warmer sound, the Momentum is where it’s at. They provide plenty of detail and clarity, but with an added boost in the bass to render you nodding your head. It’s not quite a bass-head outfit, but comes close. By contrast, the M500 is neutral and balanced, with more gradual peaks and valleys in the frequency response. That said, the M500’s treble is a bit more resolving, with some nice shimmer and sparkle without coming across as harsh. If you’re craving a more analytical response by comparison, the M500 is your boy. Well that’s about it for today my friend! I hope you’ve enjoyed this article on the Sennheiser Momentum vs. KEF M500.